As a poultry expert and mother, I am passionate about providing the best quality food for my family. In my role, I spend a lot of time observing the buying habits of consumers, and I have noticed that many people do not realize there is a difference between fresh and thawed chicken. The cheapest meat available is usually thawed poultry. This is meat which is frozen at the source (often in faraway countries such as Brazil and Thailand) and then defrosted once it arrives in the destination country, and sold as a “cheaper” alternative to fresh poultry. During the thawing process, meat loses essential vitamins and minerals and also becomes less tasty. In essence, “thawed” chicken means “defrosted” chicken, although there are some differences in the process. Yes, even simple chicken can have multiple ingredients on the label. Thawed chicken can be one of the worst offenders. Watch out for labels that include multiple E-numbers, including E451. Ask yourself: do you really want to be eating chicken with multiple additives over fresh poultry? Thawed chicken often includes added salt too, pushing up sodium intake. 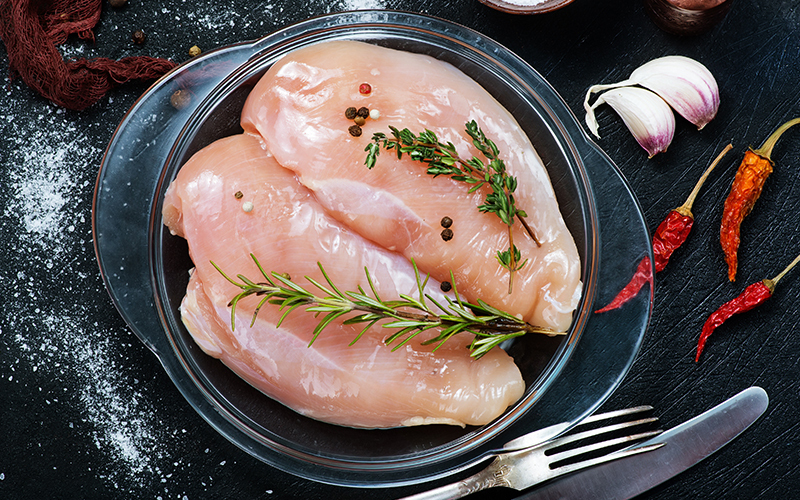 By purchasing fresh poultry, you are buying just the meat – with no additives, emulsifiers or added flavoring. UAE law is strict when it comes to food labeling. All poultry that is defrosted must be listed as such on the packaging. So look out for words such as “thawed”. Equally, if poultry is fresh, you will find “fresh chicken” listed in the product description. This means it has been freshly slaughtered. If you do choose to buy thawed chicken, keep in mind it cannot be frozen again. Every time you refreeze meat, the taste weakens, and it causes bacteria development. A brand’s name is absolutely not a guarantee of chicken freshness. Just because a brand includes words such as “fresh” in their title, it doesn’t mean that it’s not thawed meat. Make sure to properly check the label, rather than just the brand name. Although fresh chicken is often sold side-by-side with thawed chicken, it is a world away in terms of quality. Alafya chicken is fresh, local poultry, with no hormones. The chickens are kept cage-free, and reared in a natural environment, with natural chicken feed. The poultry is slaughtered the night before it is sold in the supermarkets, for optimal freshness. As an insider at Alafya, I am confident with the company’s practices and treatment of its chickens, and it’s my choice for my child. Try it and I promise you will be amazed by the taste.